Avie’s Ski / Sports carries an extensive collection of recreational gear and apparel for all seasons. Expansion in 2016 more than doubled retail floor space. At Avie’s Ski / Sports, you will find a very large selection of name brands tailored to offer the best shopping experience possible. You will find inexpensive quality outer wear for fast growing children. And you will find “hard as nails” gear built to adult specifications. Avie’s staff always give you outstanding service. Then we work with you to get the right fit. Most importantly, we make sure you leave satisfied with your shopping experience. First off, Avie’s Ski / Sports specializes in winter sports. On-hand is an expanded line of alpine skis and accessories. Helmets, boots, gloves, and poles. Snowboards, bindings and boots. Nordic ski packages too. Secondly, The North Face outerwear and Smartwool base layers provide everything you need for a fun and comfortable day on the slopes. Finally, and best of all, multi-day ski rentals, seasonal ski lease packages, and day trips to Vermont and New Hampshire ski destinations, puts you on the slopes at reasonable cost. Furthermore, ski and snowboard tuning and waxing supplies are available. Even more, Avie’s staff will show you how to tune, wax and otherwise maintain your gear in tip-top condition. Avie’s Ski / Sports provides in-store clinics to help get you started, or take you to the next level. In-water dive services are available, including search-and-rescue for lost items, boat hull maintenance and cleaning, and zinc anode replacement. Check out Avie’s Blog. News. Information on snow conditions up north. Store sales, specials, coupons, and events. 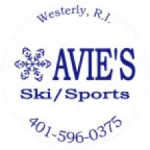 Avie’s Ski / Sports was opened in 2000 by Ted Avedesian after years of managing Alpine Ski & Sports. Ted’s goal for Avie’s, which is named after his father, is to provide the best full service ski and sports-oriented shop in the area, and to give customers the best service at the best price with the greatest of pleasure.